Geckos outclass adhesive tapes in one respect: Even after repeated contact with dirt and dust do their feet perfectly adhere to smooth surfaces. Researchers of the KIT and the Carnegie Mellon University, Pittsburgh, have now developed the first adhesive tape that does not only adhere to a surface as reliably as the toes of a gecko, but also possesses similar self-cleaning properties. Using such a tape, food packagings or bandages might be opened and closed several times. When moving forwards, the gecko‘s toes drag across a part of the surface. As a result of this lateral friction contact, larger dirt particles are removed. Smaller particles deposit among the setae on the sole and in the skinfolds below. In an experiment, the researchers have proved that both mechanisms provide for 95% of the self-cleaning effect. 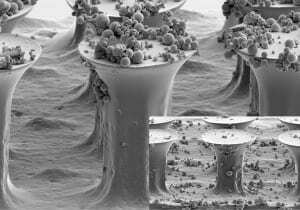 “This effect is determined by the ratio between particle size and setae diameter“, Dr. Hendrik Hölscher of KIT’s Institute of Microstructure Technology (IMT) says. For their experiments, the scientists used elastic microhairs of variable size. Instead of dirt particles, they employed glass spheres of micrometer size (10-6 meters) and distributed them on a smooth plate. To simulate the steps made by a gecko, they pressed an artificial adhesive tape covered by microhairs onto the plate, shifted it laterally, and lifted the tape off again. This “load-drag-unload“ cycle was repeated several times. In parallel, adhesive force was measured. When the diameter of the spheres exceeded that of the microhairs, the adhesive force disappeared after the first contact (”load“) – as in case of an ordinary adhesive tape. After eight to ten test cycles, however, the gecko-inspired adhesive tape reached 80 to 100 percent of its original power again. “In the long term, this effect might be used to develop a low-cost alternative to hook and loop fasteners,“ Hölscher says. “Such a tape might be applied in the sports sector, in medicine, automotive industry or aerospace technology,“ Metin Sitti, Professor of the Carnegie Mellon University, adds. April 11, 2019 - If you're a cat or dog owner, this top-rated Amazon tool is the best $25 you'll spend Yahoo LifestyleMeet the Chom Chom: The best-selling pet hair remover with thousands of positive reviews. April 1, 2019 - JD.com expands 'green packaging' to nearly 30 cities KrASIAE-commerce brings convenience to millions of shoppers, but a worrisome side-effect is that it contributes to mounting packaging trash.